Last week, I let go of a Facebook blogging group I created a year and a half back. I felt that the group was getting a bit stale and I needed to make place for something new. When one of the members sought my ‘permission’ to start a similar group I was amused. No offence to her, I know she’ll do a great job of running the new group. The reason for my amusement was that I have no copyright over the idea. It got me thinking of why we might sometimes cling on to projects and things we’ve created. Is it hard for creative people to let go of what they know and move on to exploring new ideas? Creative people cannot afford to suffer from a scarcity mentality. If we do, it just hinders us from creating. We have to let go of formats and templates that have worked in the past. If we don’t, we’ll stagnate. I remember reading one of Alan Cohen’s newsletters in which he talked about the difference between leading a reparative life – choosing survival, safety and security and a creative life – exploring, creating and living free. The title of that piece remains with me: Safety is not our goal. Imagine if the Michael Angelos, the Columbuses, the Wright Brothers, the Steve Jobs of this world decided to play it safe. The world would be a very different place, wouldn’t it? Creativity requires us to explore, to discover, to experiment, to dare to think outside the box. It calls for us to risk failure, to be prepared to be mocked at even. Creativity is not for sissies! 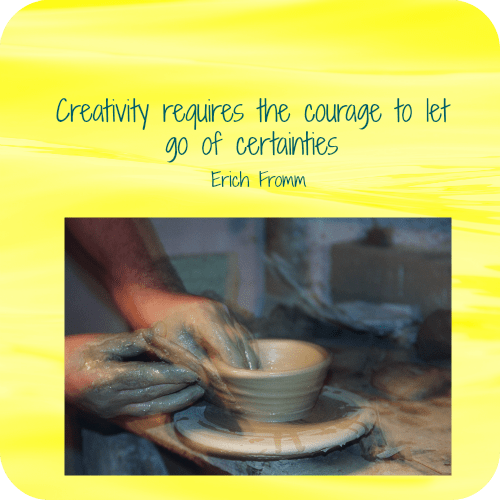 Today I urge you to let go and discover the power of your creative potential! Today I’m linking in to Stirrup Queens #MicroblogMondays and Write Tribe’s Wednesday Prompt. Good idea! I’ve been ‘playing safe’ but know I’m stifling my creativity.